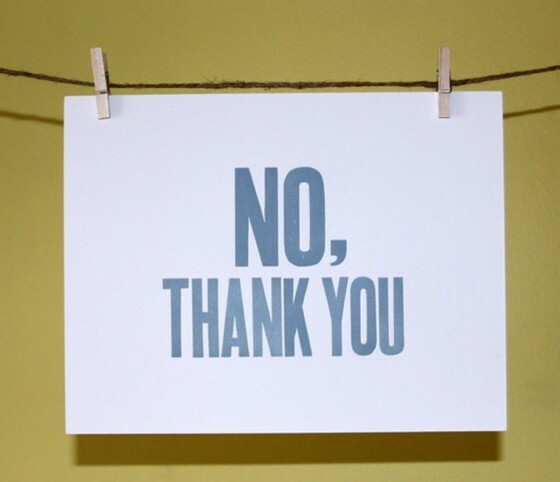 I’ve always known there is great power in saying no. That sometimes we get our best YES’s when we have said NO to something, or someone. But there’s a big difference between knowing something, and doing it. I’ve often found it difficult to say no. It has somehow felt combative or aggressive. Not polite, perhaps. And then there’s FOMO — Fear Of Missing Out. What if I were to say no to something really important (perhaps something that doesn’t look so important going in, but turns out to have life-changing possibilities)? And like many folks, I’ve put pleasing other above pleasing myself for a long time. Even though it’s true that many people would actually be happier if I said what I wanted, even if that’s a no, rather than said what I imagined I wanted them to hear. And of course I imagine they want me to say yes. Otherwise, why would they bother asking? Of course it’s easy to see how silly, circular or groundless those objections to saying no are now. But at the time and in the moment — lacking in the insights that some conscious reflection might provide me — saying yes can seem like the simplest, easiest and most courteous thing to do. Even if it meant a part of me was unhappy in saying yes and in doing the thing I’d said yes to. Very recently I said no to something. Not so much out loud and using words, but using my behaviour. My body said no, by way of what I chose to do, the actions I chose to take. This seemed risky to me. What if I offended somebody? What if somebody thought less of me for behaving (vs. saying) no? What if someone misinterpreted my behaviour and assigned intentions to my no that weren’t there? What if…. well, the what if’s seemed endless. And I knew that continuing to entertain the what if’s was a recipe for the kind of mental agitation that can upset your wellbeing applecart. And I value my wellbeing very highly now, having experienced a long period of time where my grasp on it wasn’t always so consistent and firm. So it was time to let the what if’s drift off. And in their stead, to feel confident in my no. To feel firm in my choice. To connect with an inner sense of strength, that my no was and is right for me. That a better YES is guiding me away from something that isn’t right for me right now. And to really feel the sense of well being and innate worth that is my birth right, as it is every person’s birth right, to make a decision that feels right for me, and to act on it. Even if that decision is a no, thank you. More posts from my observations and experiences from traversing the landscape of happiness, and its surrounds, over the last 11 months here.